Real Red-necked Wallaby Skull For Sale – Skulls Unlimited International, Inc. The Red-necked wallaby is a member of the family Macropodidea. The wallaby resembles a small kangaroo, with a strong tail and the ability to leap great distances. Wallabies are nocturnal herbivores and consume mostly grasses. The wallaby inhabits Australia, New Zealand, and Papua New Guinea. You can only add 16 Real Red-necked Wallaby Skull. 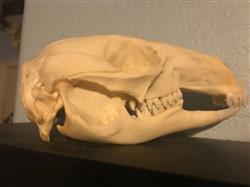 I love this Wallaby skull. Some of the nasal structures were very slightly damaged and flaky, though it was packed with the utmost care. Very good buy in my opinion. Such a unique marsupial skull!